When I was applying to join the Rines Angel Fund at the end of my freshman year, many of the current members whom I spoke with referred to their fellow members as “casually intelligent”. Although that term bewildered me at the time, after a little over a year working with these students, faculty members and mentors, I know exactly what they meant. Folks involved with the Fund are intelligent, high-achieving, and ambitious people, yet they are also extremely humble and easy to interact with as a friend. Professor Jeff Sohl, Faculty Advisor for the Rines Angel Fund and Director of the Center for Venture Research at the University of New Hampshire. This concept of a “casually intelligent” characteristic certainly does not exclude our faculty advisor, Jeffery Sohl. When I first met Professor Sohl officially, it was my first-ever Fund meeting, fall semester of my sophomore year. I did not know what to expect from a man whose Google search led me to several academic essays he had written for the U.S. Securities and Exchange Commission, academic institutions and countless business publications. However, walking into class that first day, I was immediately struck by his casual and friendly demeanor. Professor Sohl is considered one of the top experts in America on the topics of raising capital for early-state ventures and women in angel investing. He arrived at the University of New Hampshire in the early 80s as a business professor and quickly became involved with the Center for Venture Research, which he now oversees as director. The center conducts and publishes research that has been featured in Forbes, Fortune, the Wall Street Journal, the New York Times, and many more like publications. Its research covers a number of topics in the field of finance, including the impact of venture capital on the economy as a whole, and New Hampshire’s current angel investing ecosystem. 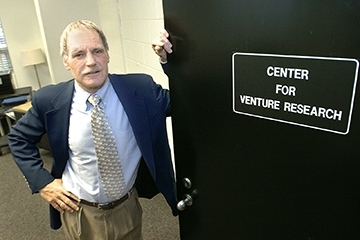 Within the past four years Jeff and The Center for Venture Research have also contributed their work to the U.S. Senate Committee on Small Business and Entrepreneurship, the U.S. Securities and Exchange Commission’s Advisory Committee on Small and Emerging Companies, and the Commonwealth of Massachusetts Senate and House of Representatives. The Center, and in turn Jeff, has a stake in a number of important governmental decisions made each year on both the state and federal levels. Professor Sohl embodies the “casually intelligent” trait because his work has an international and significant impact, but he still comes into our meetings twice a week, relating to students with ease and frequently making jokes to retain interest and convey points. Students in the Fund look up to his life’s work, while simultaneously creating a personal relationship with him – an atmosphere of extreme mutual respect that is not always seen between student and professor. As a student-run investment fund, it is imperative that the members of the Fund not only conduct quality due diligence on the companies that pitch to us, but also continuously learn. It is clear from his qualifications that Jeff Sohl was the perfect individual to start the Rines Angel Fund, and is the best person to continue leading this experiential learning program. It is a great honor to work with Jeff Sohl, and to watch as his work in and out of the Rines Angel Fund continues to make international waves and develop future business leaders. Zachary Dresser is a Co-Managing Director of the Rines Angel Fund, and a member of the Class of 2019 at the University of New Hampshire. Learn more about Zack.